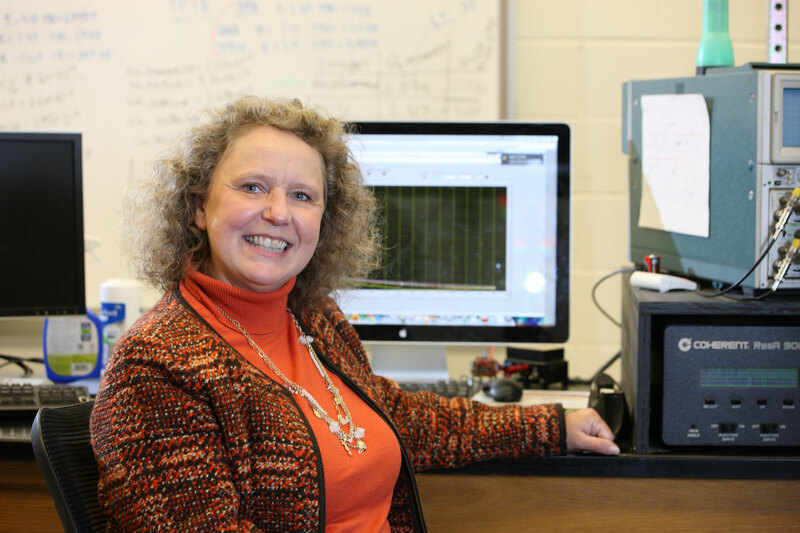 The first person in her family to attend college, mechanical engineer Pamela Norris has founded two research laboratories, secured several patents and drawn more than $25 million worth of research grants to the University of Virginia over the past 22 years. That’s not all: She’s also become a champion of mentoring and a leader among the University faculty and the School of Engineering and Applied Science. For these accomplishments, UVA’s Maxine Platzer Lynn Women’s Center has selected Norris to receive the 2016 Elizabeth Zintl Leadership Award. Norris, Frederick Tracy Morse Professor of Mechanical and Aerospace Engineering, will receive the award Sept. 22. Faculty and students in the Engineering School and around Grounds hold Norris in high esteem. Her stellar record of research, teaching and administration led the Engineering School’s dean, Craig Benson, to promote her to executive associate dean for research last fall. She earned the school’s Distinguished Faculty Award in October. A fellow of the American Society of Mechanical Engineers, Norris also has served on pan-University committees, such as Women’s Leadership Council, and in the Faculty Senate. Norris is known for her leadership in increasing the diversity of faculty in the fields of science, technology, engineering and math, especially through the NSF-funded UVA CHARGE program, which focuses on increasing the number of women in these disciplines as well as economics and the social sciences. One of the principal investigators, Norris also serves as program director of the multi-pronged initiative, now in its fourth year. The Elizabeth Zintl Leadership Award is presented each year in honor of Elizabeth Zintl, an accomplished writer and journalist who served as chief of staff in UVA’s Office of the President. The award honors women working across the University who exemplify the high degree of professionalism, creativity and commitment that characterized Zintl’s contributions to UVA. Past recipients include Farzaneh Milani, professor and chair of the Department of Middle Eastern and South Asian Languages and Cultures (2015); Jane Miller, senior associate athletic director for programs (2014); Dr. Karen Rheuban, medical director of the Office of Telemedicine (2005); and Patricia Lampkin, vice president and chief student affairs officer (1998).